President Barack Obama has told Latin American leaders that the days when the United States could freely interfere in regional affairs are past. Barack Obama was speaking just before the VII Summit of the Americas in Panama City. The US president and Cuban leader Raul Castro shook hands as the opening ceremony began, their first encounter since a December detente. Barack Obama and Raul Castro’s historic formal talks due on April 11 could be overshadowed by tensions between Venezuela and the US. The US president told a forum of civil society leaders in Panama City that “the days in which our agenda in this hemisphere presumed that the United States could meddle with impunity, those days are past”. At past Summits of the Americas, which bring together the leaders of North, Central and South America, the US has come in for criticism for its embargo against Cuba and its objection to having Cuba participate in the gatherings. This seventh summit is the first which Cuba will attend and much of the attention will be focused on the body language between the former foes. 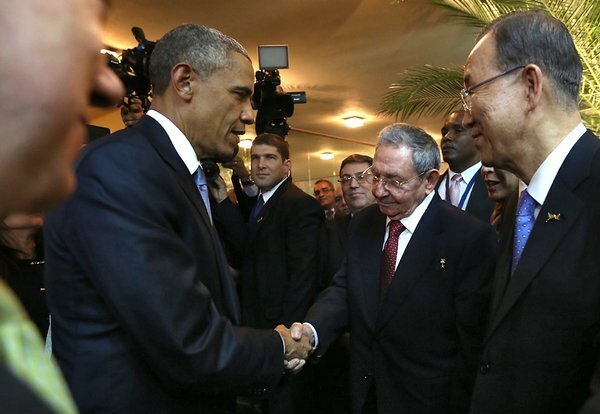 Barack Obama’s speech before the summit came a day after the State Department recommended that Cuba be removed from the US lists of countries which sponsor terrorism.